2000XL Series - Blue Max Lighting & Emergency Equipment Ltd.
Tomar Electronics model 2000XL series is a compact Hazardous Location LED warning light engineered to perform in the harshest environments. Constructed of 30% glass-filled thermoset polyester it is particularly well-suited for installations in corrosive, wet NEMA 4X harsh environments, and hazardous locations. This high strength FRP material is resistant to the corrosive effects of most chemicals, hydrocarbons and solvents. Typical applications include manufacturing plants, chemical and petrochemical processing facilities, sewage treatment plants, off-shore and dockside installations, agricultural, commercial, industrial, mining and marine facilities. Totally non-metallic these warning lights are fully sealed for NEMA 4X capability in any mounting configuration – base up, down or side positions. Their compact design makes them ideally suited where space consideration may be an issue. Unique mounts allow for Pendant, Flange (Ceiling), or Wall mount installations. Buy just the mounting style you need, or install directly onto approved panel surface. Optional dome guard is also available. Available in either Flashing or Steady-burn mode, this model will operate over a wide AC and DC input voltage range. The DC version operates from 10-100 VDC, and the AC version from 85 – 265 VAC. Note: Mounts and Compact Dome Guards are sold separately (see Below). Please specify LED color, and if blackout cap is required. Available LED colors are Amber, Blue, Red, Green and White. 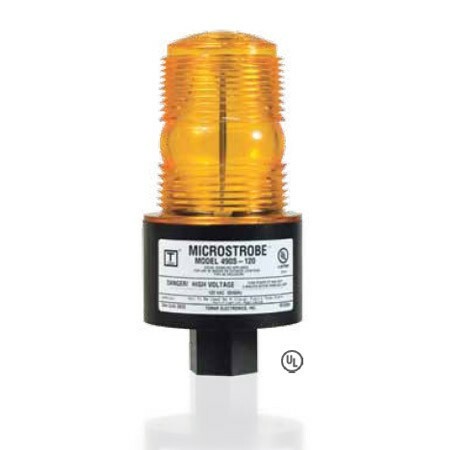 Visual signaling beacon shall be Tomar Electronics model number 2024XLF, 2124XLF, 2024XLS, or 2124XLF or approved equal. The beacon shall be cCSA/us Listed Class I, Division 2, Class I, Zone 2, Class II, Division 2, and Class III for use in specified hazardous locations and / or combustible atmospheres as classified by the National Electric Code. The warning beacon shall be of non-metallic glass-filled thermoset polyester construction. The light source shall be a single high-power LED. DC voltage range shall be from 10-100 VDC, and AC voltage range from 85 – 265 VAC. 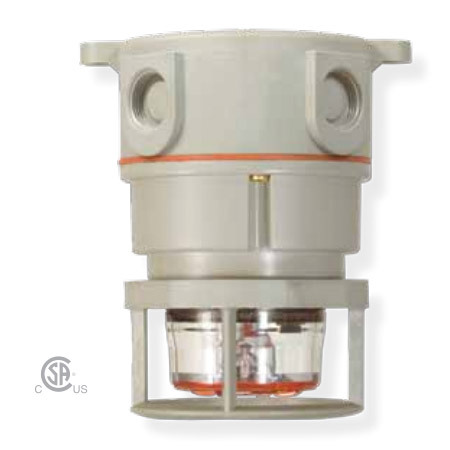 The warning signal shall be NEMA 4X rated in any mounting configuration – base up, down, or side positions.